The past few months have been successful for Homes of Light thanks to the amount of support we have received from partners, both old and new. I previously wrote about Famous Pub, who was gracious enough to host a blanket drive for us through Veteran’s Day and the holiday season. When a previous partner caught wind of the drive, they were more than eager to join the effort. Taylor from Emory University has a history of giving her time and energy to helping those in need, and has been a significant force in helping us combat Veteran homelessness. Last year she organized a blanket drive that resulted in a warm winter for our clients. When she heard about the drive we were having at Famous, she immediately informed us that she wanted to partner with them and create more donation drop-off locations on campus. Within a few weeks, she was able to get the word out across campus with help from our social media intern and her friend Hannah (pictured). Together they collected several blankets as well as other much needed items such as coats and toiletries. 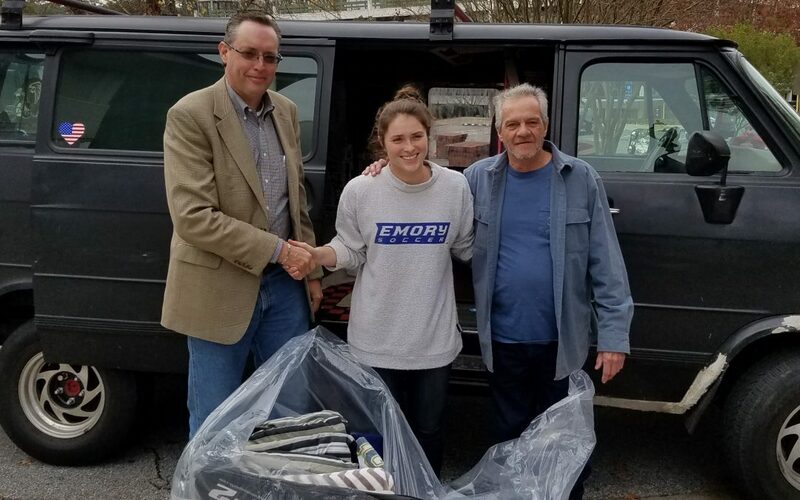 This holiday season will once again be bright for so many of our Veteran clients thanks to Taylor, Hannah and the students at Emory University.